2011 holiday letter…. with humility « AFTER THE POP ! As another December rushes by and 2011 folds itself up, I find it appropriate to send holiday greetings and wishes for you and your loved ones. It seems to have been a very hurried year- I don’t remember one rushing by quite so quickly. Denver remains my current home, and continues to grow with me and around me with leaps and bounds. I don’t mean just by population, but also the growing up it is doing as a metropolis. Rail services, high rises, museums, toll-ways, and many other markers of city living continue to pop up at almost every turn. I started my 3rd year at the public hospital and have transferred to a 3rd clinic within that system. There are new challenges that tug at my heart and test my resolve almost every day. I had no clue, upon taking this position, that I would enjoy working and learning at a campus environment quite so thoroughly. It seems with so many wonderful hearts and minds pushing in the same direction, that an entire different level of energy gets tapped somehow. It continues to be energizing and invigorating. I will be playing Santa Claus at the Women and Family Services Party this year. I’ll post a pic on Facebook. I think this’ll be the highlight of this Christmas. I managed to celebrate 7 years clean in September. The most notable difference for me is a renewed belief that a different process – emotional sobriety- needs to be the focus. I avoided growing up for so long, that it had become almost second nature for me to walk through life with blinders. For many of you, I am certain that this sounds absurd. But I know that many beliefs and habits need to be sorted through like the storage boxes in my grandparents’ basement after they passed- only with a handful of true keepsakes and much of something else. I had the good fortune to act as chairperson for the 2011 Rally For Recovery for Advocates For Recovery in September. It was the 10thannual celebration to celebrate and make more visible the benefits of recovery- not only to the individuals directly involved, but also to the families, the workplaces, and the communities of the recovered individuals. No doubt it is hopeful for people struggling with sobriety to see many individuals with long term clean time. It has become important to me that a concept of something wholesome and positive can exist beyond the image of addiction. So often- jails, institutions, and death are what follow in our collective minds. Thus, a more visible reminder that wonderful things happen with recovery is an imperative . I have agreed to act as chair for the 2012 Rally and join the Board of Directors for this organization as well. My mom is doing well. She seems settled in her retirement and happy with her DVR and her tiny garden. 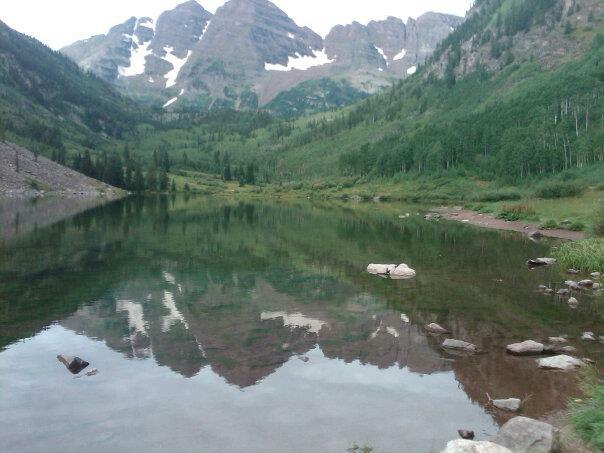 We have spent several holiday weekends with the Baileys in Idaho Springs and done some great day trips from there- the most memorable for me being Maroon Bells just outside Aspen. It is truly one of the loveliest places I have been in years. I remember the profound quiet that came upon us as we approached the peaks and their reflection in the lakes. I can only hopet that you may you find that profound sense of peace in your life. You've come a long way in a years time. Lots of good things. And 7 years is getting up there. I remember when I was newly sober and I met a woman who was 7 years sober. And that was my goal at a few months, to get to 7 years. Weird I know. You are finding your stride and you've tapped the vein of working with others and that is a good thing. That you enjoy it is even better. I wish we had here what you have there in opportunities and the comprehensive recovery systems you have as well. I am really glad that all is well and that you are continuing to grow in sobriety. You should be proud of your progress. You are always in my thoughts.